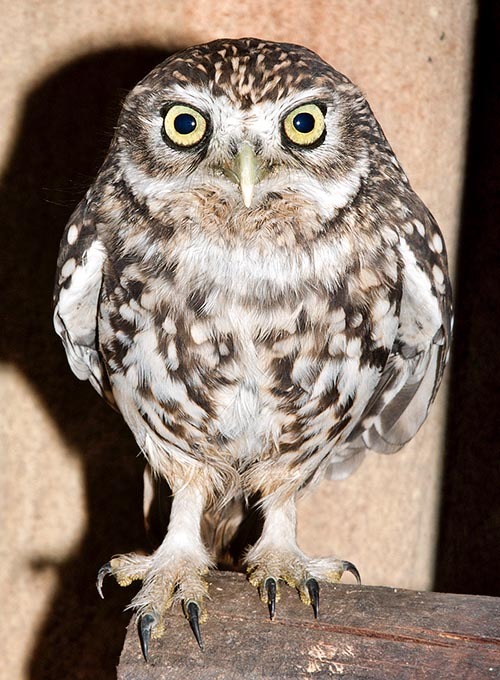 The Little owl (Athene noctua Scopoli, 1769) belongs to the order of the Strigiformes and to the family of the Strigidae. Along with few other birds it is to be considered as the species more known by us and this is due to its familiarity and to the strong frequentation of the anthropized habitats. Who on earth in Europe, in the near Asia and in the Mediterranean part of Africa has not heard its voice and, more, the traditions it draws with itself since centuries ? There is memory of tales and legends since the first millennia of our history, whose traces have been left through the centuries up to our days. Poor owl at times mistreated and considered ill omen bird whilst it is absolutely the sweetest and most sensible being with which we are dealing and worthy of the amplest consideration despite, even if this is few people behaviour, being mistreated and ill-considered! It is sufficient to have it in our hands for understanding the sweetness of this bird. It lets to be pampered, it bows to our caresses, follows our movements with those bright and sweet eyes and never dares to stretch its claws or to try to peck us with that hooked beak though lethal in biting the preys, does not even know to have such possibilities. It happens to those doing scientific surveys of these birds that having found the female hatching on the nest and having to control its contents, she at times does not even move even when we have to put our hand under its body. At most, it moves of some centimetre giving just the time for checking its contents. In the old times the owl was the sacred bird for the goddess Athena, divinity of wisdom and knowledge and has given the name to the city of Athens as well as to its generic term Athene. The specific name noctua is on the contrary referred to its night habits. Still now, as before was the case of the drachma, also on the verso of the Greek Euro is reproduced an owl. Many are the traditions carried on by this bird all over our continent. They said that if an owl had sung over the roof of a house that should have been the warning of a bad disgrace in the family. As well that it did go over the houses where was a deceased person, that the witches kept them as company animals, that during the Inquisition they were pointed as messengers between the devil and the human being. Its name has conditioned also our language: women acting like owls… careful as an owl…. like the owl to the larks… having the eyes of an owl, but none of these illations do have a logical explanation. 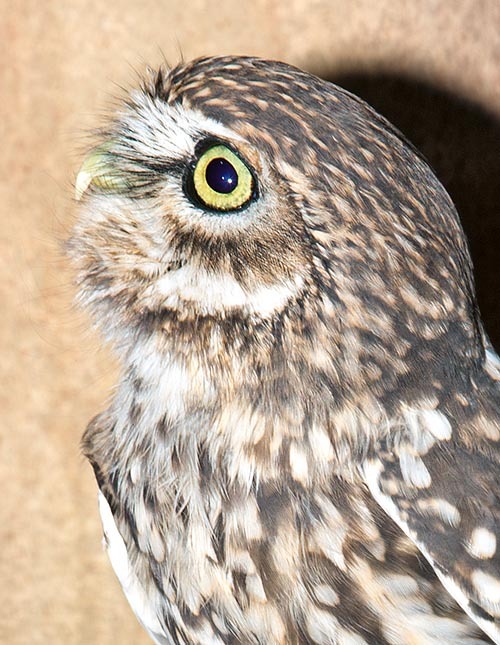 Since ever it is well known that the eyes of an owl do enchant, so much that this characteristic has been exploited by the hunters for their hunt to larks even if, actually, it’s not the eyes attracting these small birds but it is a defence reaction the larks and whatever other small bird adopt against raptors: nowadays we call it mobbing. This virtue of fascinating and bewitching, has been then passed on women though are well others and many the characteristics adopted by this being for reaching his purposes. Time ago they have often associated the presence of the owls to the cemeteries, close to the tombs and also in this case the reason is plausible. The memory lights on the graves, as well as nowadays the streetlights, attract during the night the insects and their possible predators, both choice morsels for the owl, that never misses a chance, to search these lights for seizing them. This small strigid, reproduced in the most different forms, has even entered our daily tradition as a present to the loved ones, as wish for happiness and prosperity. Concluding, there is no doubt that this bird, for better or for worse, has entered our day life staying fully among the symbolism of our virtues: the eagle with the immortality, the fox with the craftiness, the lion with the strength and our owl with the wisdom. 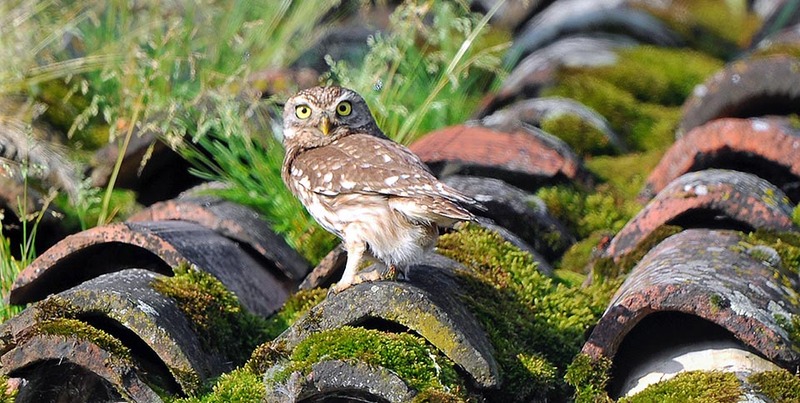 Some of the European vulgar names are: Little owl in English; Steinkauz in German; Mochuelo europea or Mochuelo común in Spanish; Chevêche d’Athéna or Chouette chevêche in French and Steenuil in Dutch. The owl lives all over Europe, in the Mediterranean Africa and part of Horn of Africa and in the temperate Asia up to Korea, with vast localizations also in the Arabian Peninsula. In Europe, it does not pass the line of the Baltic Sea whilst is present in southern England where has been introduced by the mid of the XIX century and is now considered at the level of local avifauna. It is also present in New Zealand and also regions remote to its traditional range but always after introductions made by the man as help in hunting the small rodents. The rapidity of acclimatation and of adaptation to the various habitats, renders this bird extremely versatile and capable to maintain the population at guarantee levels in future. In Italy and also in most Europe, it’s the most common night raptor that has best adapted to the rapid modifications made by the man and often harmful for other species of birds. The owl coexists with the man. Every city, country village, abandoned rural houses, churches and belfries and old buildings of every sort, see its constant presence. Its proximity is not always noted as it is a very discreet bird and only through some particular marks it is possible to understand, without ever having felt it before, that on the roof of one’s house there is since time, a resident owl. Night bird that does not disdain to stay in front of its burrow basking early in the morning before entering home for the long daily sleep or, much before sunset, sneaking out from the improbable hole and stretch yawning for getting ready for the evening outing. Taciturn, it keeps leaning on the tiles or on the vents of the chimneys while observing impassive and without any fear the persons passing just under the gutter a few metres far away. Only when in love or while looking for the partner, it emits those fateful sounds, however not awkward, that once froze the moods and the blood of the superstitious. Another well visible trace are, conversely, the pellet they reject in the digestive phase and that accumulate in customary places perhaps leaving the only evident trace of their presence. It does not love the mountainous and woody areas preferring cultivated and open plains, possibly furnished with supports where to perch for its waiting hunt. Its habitat rarely exceeds the 1000 m of altitude or, much better, it avoids those areas where the permanence of the winter snow cover lasts for periods longer than the usual ones of its traditional areas. Whilst in most part of the range the owl has shared its own territory with the man, in some zones like the Middle East, in some Mediterranean islands and in pre-desert areas this bird has maintained the traditional and old way of life that sees it distant from the human activities and nesting among the rocks and in the stonewalls. The owl nourishes mainly of small rodents, of insects, of lizards and amphibians and of any other prey suitable to its size and also of small birds it catches during the night while the same are perched sleeping. It seizes also small game during the first phases of their life. Usually, it greedily swallows the whole prey or big parts of it, regurgitating periodically a big pellet containing the indigestible parts, such as hairs and feathers, bones and elytra of big insects. 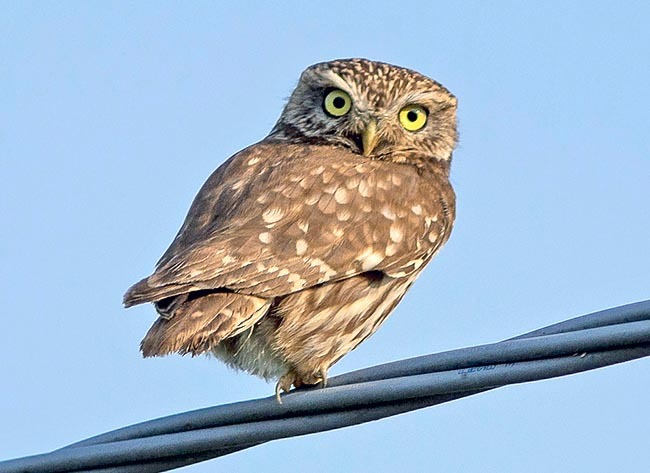 Though nocturnal, the owl hunts also during the day especially when the progeny has dimensions and requirements increasingly imperative and it is not rare to see it stationed on the electricity poles, waiting for some little animal to cross the roads. It is equipped with a strong hearing apparatus having, like all strigids, the auricular holes asymmetric so to allow the hunting in total darkness. Thanks to the remarkable flexibility in dilating the pupil, it has also a very sharp eyesight by day as well as by night. 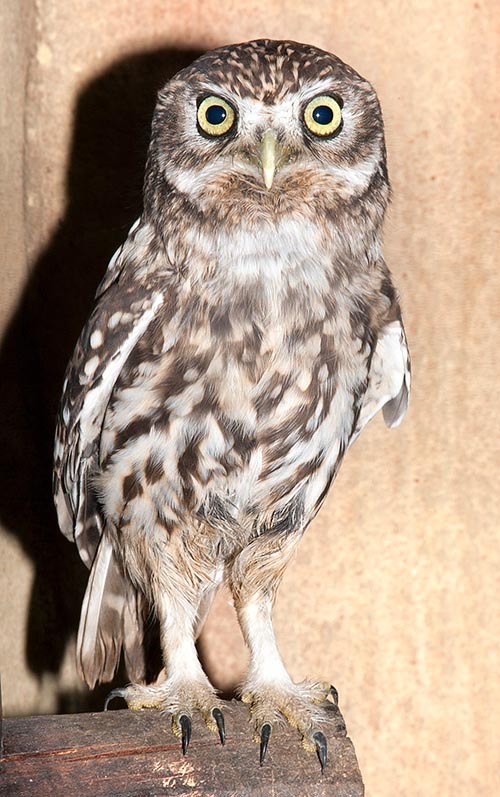 The owl is a small raptor measuring about 20 cm in length, not reaching the 200 g of weight and with a wingspan just over the 50 cm. In spite of this, it has a massive and compact body, clearly heavy for its structure even if it shows a pronounced agility almost like a rat while moving on the ground as well as in hiding among the crawlspaces of roofs and attics. It has a rapid flight, straight and strongly undulated almost always done close to the ground and such to result often invisible seen the greyish colour of its livery which merges with the underlying soil and, moreover, if done during the twilight hours with poor lighting. Then, at the end of the flight with a very short and sudden vertical rise, as if coming out from the ground, here she is appearing at the top of a pole and then immediately raise and lower the flattened head as if congratulating itself for having arrived up there. The livery is completely grey with scattered white cream spots. The chest is slightly more whitish and evidences a white underthroat ruff that it emphasizes every time it raises and lowers the head in its innate and neurotic movement. The legs are covered by white down on the whole length of the tarsus, the fingers of the paws have fairly hooked claws. For functionality of predation, the fingers are usually placed two forward and two backward even if the opposability concerns only one of them. Like all strigids, it has frontal eyes suitable for the binocular vision, of a nice lemon yellow colour with black pupil highly reactive to the light variation. The juveniles have an almost similar livery though slightly paler and during their first week of life have the eyes of a nice light blue colour. The head has a remarkable mobility and can totally spin backwards without any difficulty even if its 230° static visibility is already itself substantial. Have been classified many subspecies that have evidenced particularities linked to the territory and in other cases to the livery that results being much paler in the desert and southern zones. Easy to mistake, but only in flight, with the Scops owl (Otus scops) in the Mediterranean area and with the Boreal owl (Aegolius funereus) in the foothills and continental zones. With the Eurasian pygmy owl (Glaucidium passerinum) it rarely shares the area and this last result exceedingly smaller therefore quite difficult to be mistaken with. In the owl there is no detectable sexual dimorphism even if the female is slightly bigger. The owl nidifies practically in any place provided that it satisfies its exigencies. It is very adaptable seen that it does not build a real nest but simply spawns on the natural bottom it finds in the chosen shelter. It much loves the interspaces of the roofs, the attics, the holes in the old dwellings, the dormers of the churches but does not disdain niches in old trees also in the public gardens, artificial nestboxes, barns and even cardboxes abandoned in the attics. It has so much adapted to the human constructions to frequent more and more often the industrial zones, nesting also in the interspaces of the sheds where it appears having found an ideal place for civilizing also these new areas. During the reproductive period the owl emits a variety of sounds at times monotonous but that result well known and nowadays being part of our living. As soon as out from the den and for signalling the limits of the occupied territory, it does not fail to emit its continuous “bee beeeo bee beeeo bee beeeo” but during the courting emits also whistles and typical puffs. Typical is also the usual “woo woo woo woooooo”, very frequent chant in the strigids even if emitted with different tonalities. 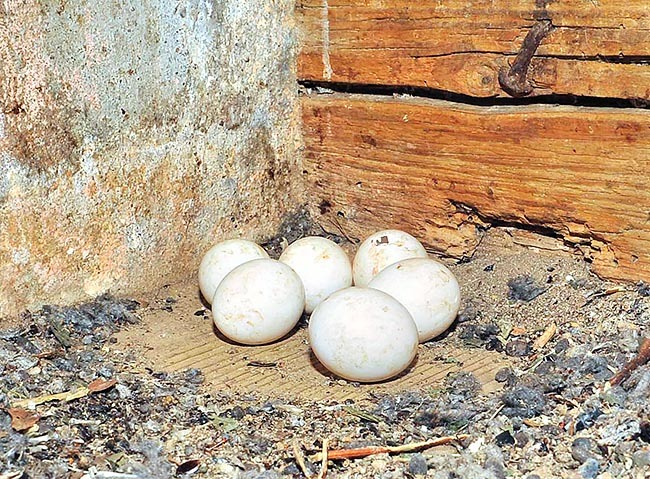 It lays 2 to 5 eggs with peaks of even 7 depending on the availability of food and the lengthening of the cold season. The eggs are laid one per day and hatched immediately therefore the chicks at the birth have the relevant days of difference. They are laid on the bare ground and the nest enriches with the time of leftovers of food, of feathers and at times of rotten pellet thus creating after few weeks a stinking and dirty substratum on which the chicks add their excrements. It is rightly easy to note the presence of a nest in an attic due to the nauseating stink left by these masses of trash. 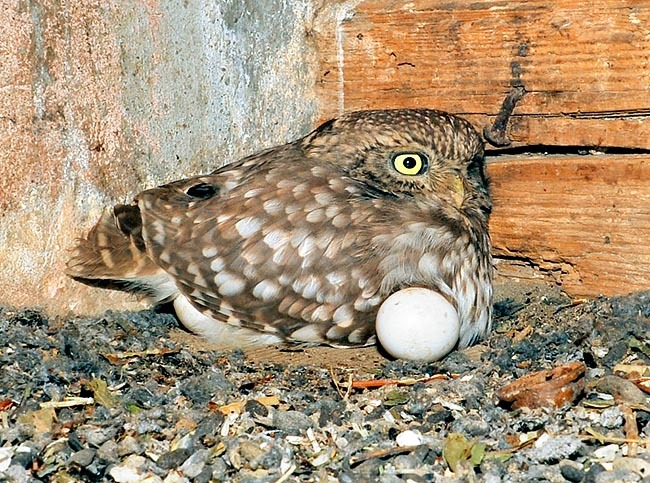 The hatching lasts about 30 days and the young do not fly before other 4 weeks. These come to life with a slight white down that swells considerably during the first days so much to make them resembling to balls of wool. After two weeks, during which have already appeared the typical greyish feathers, the young often abandon the nest scattering all around in each corner or hole or even out where they may become prey of carrion crows, rats or other strigids. It has absolutely no problems of population, seen that in Europe have been estimated more than 1 million of nesting pairs and totally in its world range, up to 15 millions. All this although having a high mortality during the first year of life. → Per apprezzare la biodiversità degli uccelli rapaci e trovare altre specie cliccare qui.